My daughter is going as Harley Quinn for Halloween this year. I, in fact, had no idea who that was. So naturally my dear tween and sweet hubby rolled their eyes at me and explained that she's an accomplice and girlfriend of Batman's nemesis, the Joker. As her name suggests, she dresses in jester attire. And that, my friends, is the extent of my knowledge on the subject! 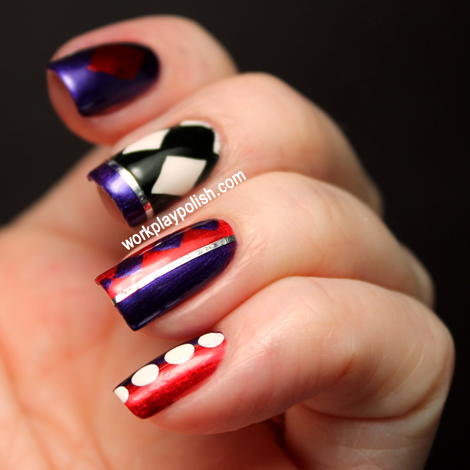 However, as I was looking at the costume, I immediately thought of my new A-England Perceval and OPI Tomorrow Never Dies! See? Relate it to polish and NOW I'm interested. 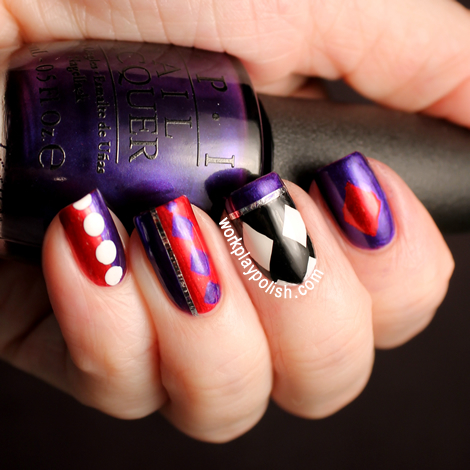 So here's a quick mani using Perceval, Tomorrow Never Dies, OPI Alpine Snow and black It's So Easy Stripe Rite. I say this was quick because I didn't fool with taping anything off...I just freehanded it all. I "embellished" with some silver striping tape to clean up some of my lines (shhhh...don't tell). 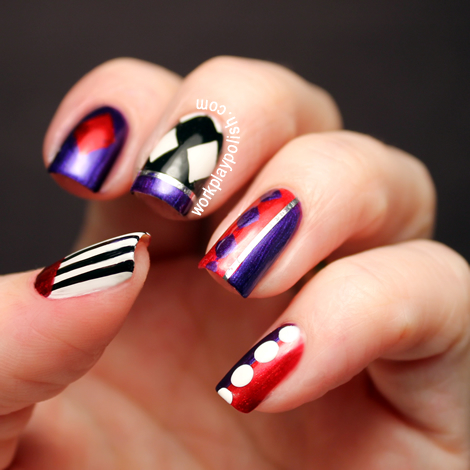 I love the purple/red and black/white color combo! It's so graphic and clean.